This story is from the Open Doors USA magazine. 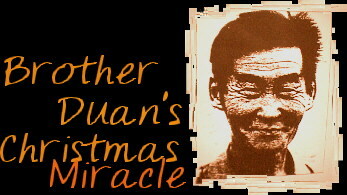 It was the greatest miracle that ever happened to Brother Duan, and he would not have experienced it had his bus not broken down. En route from a northern to a southern province of China in December, he happened to be passing through Henan province when the engine of the bus expired in its futile battle with the cold. On a whim, Duan trudged off through the fields, leaving the other passengers huddled inside the bus. He was a house church leader in northern China. Now 77 years of age, he still had no home to call his own. Truth is, he was deeply depressed. He was on his way to mediate a dispute among some leaders and was weary of all the infighting that seemed to be harming the house churches. And he was lonely. As he crossed the frozen field, Duan thought longingly of his beloved wife, who died long ago. And then the thought came into his tired mind of his little son, and an even darker cloud settled over his heart. He found a village and knocked on a door. A little cross was notched on the doorpost. The door was opened by a man in his fifties, and Duan was warmly welcomed. His feet were washed in a basin — the custom of welcoming a stranger among the house church movement — and was fed hot congee (rice porridge) and steaming vegetables. He noticed that the people were all excited. It turned out that they would be traveling to a neighboring town to hear a dynamic Bible teacher from one of the bigger cities; a man named Brother Wang. As they made their way to the meeting, they told him some of the stories about Brother Wang. It was clear they loved him dearly, and one of the men explained why. “How old is Brother Wang?” Duan asked. When told he was in his early 40s, Duan’s face showed great pain. There was silence as they rode in the open cart under the stars. Brother Duan told the incredible story of how he and his wife had been evangelists in the 1950s. They refused to join the Three Self church, and Wu, an old school bully, kept accusing them of political and criminal offenses. It was only a matter of time before they were jailed or killed, but what would happen to their boy? Sharing their impressions, the couple decided on a course of action that caused Duan to wince in pain every day since. They gave their boy to Wu and his wife — who were childless — even as Wu was arranging for the couple’s arrest. Duan and his wife were arrested and sent to prison. As they arrived where the evangelist was to speak, a crowd of 200 people was already packed into the house. Like many others, Duan had to sit in the courtyard and listen to the teacher through the open window. When Brother Wang began preaching, Duan felt a terrible shock. It was like hearing himself! He began to tremble with fear. What did this mean? Even the phrases the teacher used sounded familiar. Confused, Duan staggered up to the window to see the preacher, causing a commotion as he fell over people. The preacher stopped and there was a moment of shocked silence as the men looked at each other. The crowd was hushed as they realized the amazing physical likeness. Everyone wept as father and son were reunited. The preacher told how he had indeed been brought up by Wu, who was so impressed by Duan’s act of giving that he had become a strong Christian. Wang’s adopted parents had moved away from the earthquake zone before the tragedy, but both died of cancer in their 60s. Wang became an evangelist and tried to find his real father, but Duan had changed his name so many times to avoid arrest that he had proved untraceable. Romans 5:8…10 — God demonstrates his own love for us in this: While we were still sinners, Christ died for us… For if, while we were God’s enemies, we were reconciled to him through the death of his Son, how much more, having been reconciled, shall we be saved through his life! I John 4:9-10 — This is how God showed his love among us: He sent his one and only Son into the world that we might live through him. This is love: not that we loved God, but that he loved us and sent his Son as an atoning sacrifice for our sins.